Most construction or repair projects require a permit. Wall coverings, floor coverings and minor repairs do not require permits. It is recommended that you call the Town to confirm whether a permit is needed or not. Routine permits, such as water heaters, irrigation systems, repairs, etc., can usually be approved at Town Hall upon submittal. Most permits require a short review by the Community Development Director and will be approved or denied in just a few days. Permits for major renovation or new construction typically take two to three weeks to review. All work permitted within the Town must be inspected. Depending on the work being done, there may be multiple inspections that need to occur. The plan review report that is issued with the permit will list the inspections that will be required by the Town. To schedule an inspection, please call 817-617-3700. Any request for inspection made between the hours of 8:00 am and 4:00 pm, Monday through Friday, will be scheduled for the next business day, schedule permitting. 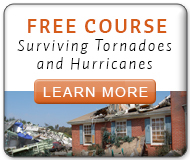 Once you are on the main website you will click Course Catalog, View full course list and then scroll down to the course titled Surviving Tornadoes and Hurricanes.